Britain is spearheading a revolution in cross-laminated timber buildings and the results are catalogued in a new book – but will a post-Grenfell ban on combustible materials in facades stymie innovation? Cross laminated timber (CLT) construction has risen to giddy heights since it was introduced in the UK in 2003. 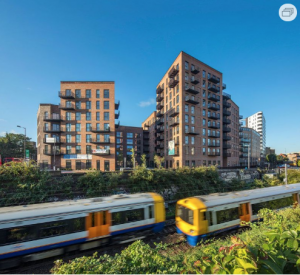 Starting out as a niche material with strong environmental credentials, layered engineered timber has grown in profile to become recognised as a speedy and economic alternative to steel and concrete for a wide range of building types. Architects and contractors are pushing creative and technical boundaries to expand the material’s capabilities. A new book, ‘100 Projects UK CLT’, compiled by Stirling Prize-shortlisted practice Waugh Thistleton Architects, catalogues the diversity of projects delivered in the UK over the last 15 years. The new legislation is expected to result in changes to the way CLT structures are designed in future, but this may spur on innovation rather than hold it back. For example, the world’s tallest mass timber tower, Brock Commons in Vancouver, is concealed behind a skin of drywall and concrete topping, mainly to comply with locally accepted fire-safety codes.